My wife and I spent the weekend at the beach in Southern California, so I'm going to let the indicators do most of the talking this week. But in short, I'm of the mind that after "correcting the correction," the stock market is currently in the process of seeking an equilibrium point. A healthy dose of hindsight makes it clear that December's dance to the downside was based on fear of policy missteps and was completely overdone. And with the dueling fears (Fed and trade) looking to be "solved" (or at least on their way to being solved), stocks are now trading on expectations for future growth. The wildcard, of course, is if #GrowthSlowing is going to put a monkey wrench in the game. Currently, it appears that investors are expecting the best. Next, we can mix in the fact that the indices have basically gone nowhere since the beginning of 2018. And with earnings having grown nicely since then, the bulls contend that there is still upside to be had. And finally, when you consider that a great many funds were positioned on the wrong side of the recent advance, it isn't surprising to see managers continue to put money to work. So, for now at least, it looks like the bulls continue to retain possession of the ball and remain in control of the game. 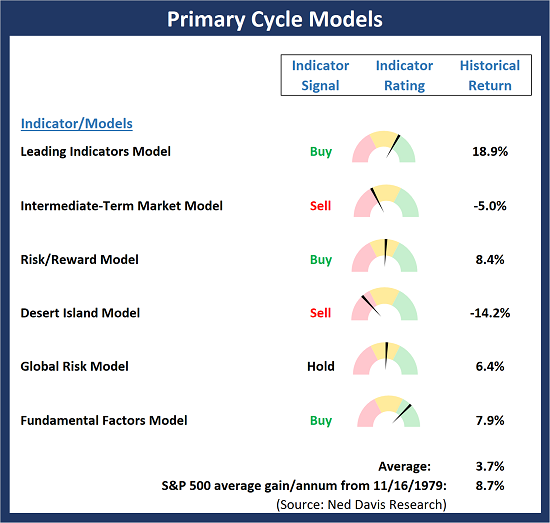 There was one positive change to the "Primary Cycle" board this week as the Leading Indicators Model (a composite of 10 indicators that have "led" market moves in the past) moved up into positive territory and flashed a buy signal. But while the price action in the major indices (Q1 returns were the best since 1998) continues to look strong, my Primary Cycle board suggests that at least some degree of caution remains warranted. On a positive note, the historical return reading for the board now stands at its best level since 12/10/18. This week's mean percentage score of my 6 favorite models advanced to 49.5% from 47% last week (Prior readings: 50%, 47.9%, 45.4%, 40.3%) while the median held steady again at 50.0% from 50% last week (Prior readings: 50%, 50%, 46.3%, 42.5%). 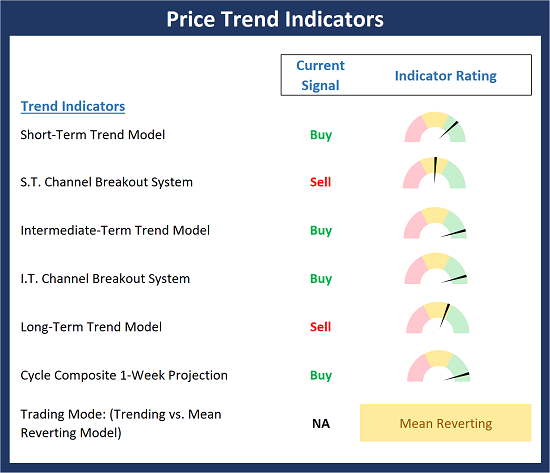 The Price Trend board saw some meaningful improvement last week, and is likely to see another uptick early next week as our Long-Term Trend Model is literally "on the line" at the moment. So, unless price plunges early in the near-term, this model will join the short- and intermediate-term models on buy signals and in the green zone. In addition, the cycle composite points higher for the next few weeks. 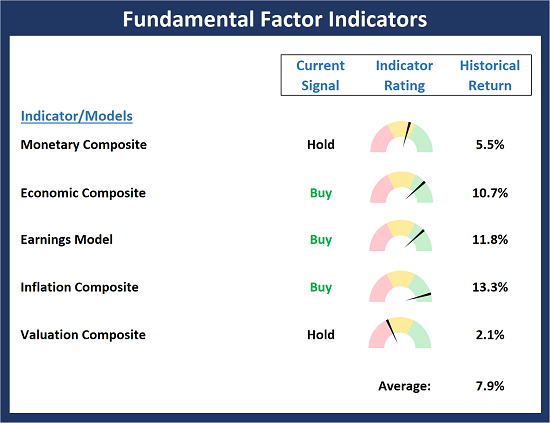 And finally, our "trading mode" model is starting to move toward the "trending" zone. All of the above would provide solid confirmation that the bulls are in charge and a new leg in an ongoing bull market is underway. 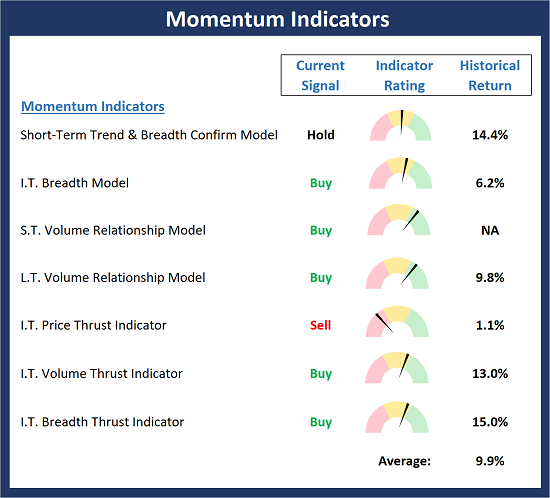 The Momentum board tells us that the strong momentum seen during the initial phase of the rally has waned. However, the historical return reading remains above trend and thus, my view is that this remains a buy-the-dip environment remains. 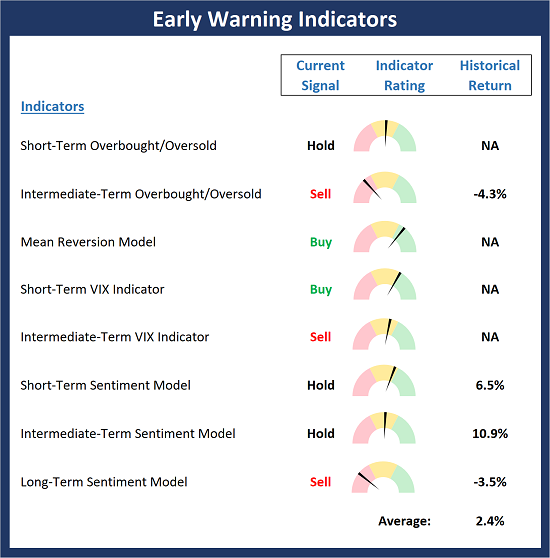 My take is the Early Warning board continues to wave a yellow flag. However, our mean reversion model flashed a buy signal last week and the bears have been unable to get anything going this year. Thus, we will have to continue to give the edge to the bulls at this stage. There were no major changes to the Fundamentals board this week. However, it is worth noting that the Monetary Composite continues to advance and is nearing the positive zone and both the Economic and Valuation Composites continue to soften (the Valuation Composite is on the verge of moving into the negative zone). But in all, the board suggests the backdrop remains constructive for the bulls.